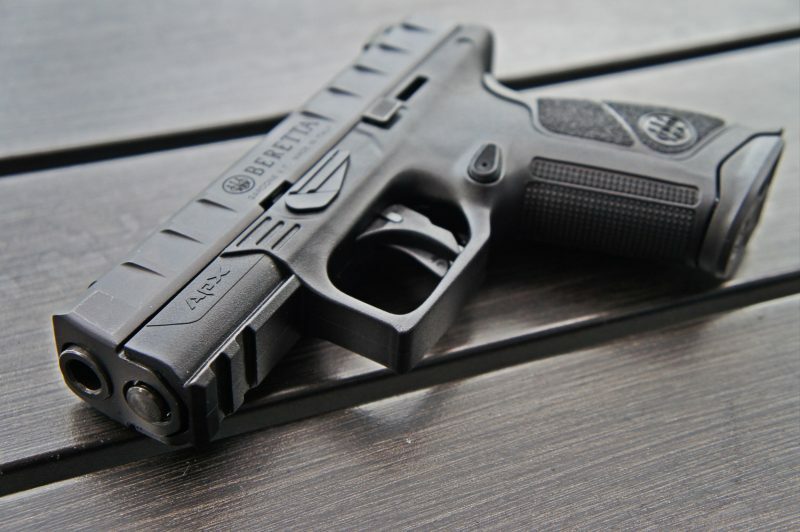 Beretta launched their entry in the striker fired market, the APX, a couple of years ago. Originally intended as Beretta’s entry into the Modular Handgun System competition, the APX was initially only offered as a full size pistol. New for 2018, Beretta has brought out two new sizes for the APX: the Centurion and the Compact. Today we’ll take a first look at the Centurion. Like the full size APX, the Centurion is fully modular, meaning that the serialized part is the fire contro system and can be swapped out to different sized frames. If you buy a Centurion and decide you want a compact, all you need to do is go to Beretta’s website and order the frame and slide. Too easy, right? Additionally, the Centurion has one immediately noticeable upgrade over the full size pistol; the lack of finger grooves on the front strap. The removal of finger grooves means there’s more room for the fairly aggressive texturing, which is a good thing. The Centurion fits right in that “Glock 19-ish” envelope of guns that are large enough for every day duty use and also small enough to be carried concealed with relative ease. Sights are pretty much what you’d expect, boring three dot sights. Aftermarket sights are available from Beretta, including fiber optic front sights, adjustable rear sights, and tritium night sights. Suppressor height sights will be available around SHOT of next year. Unfortunately, the sights use a proprietary dovetail, which is silly, but whatever. 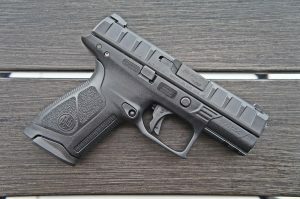 Similarly, the APX doesn’t fit any current holster molds out there. I know Beretta is working with several good holster manufacturers such as Dark Star Gear and Phlster to get good kydex to the market, but the timetable on that is probably July at the earliest. Right now, options for concealment are pretty limited. As far as the gun itself goes, the data that actually matters is that the trigger breaks consistently at 6 pounds, and I needed to instal the large backstraps to make the gun big enough to grip properly with my medium/large hands. The factory “medium” backstraps is just too small, and I’d like to know what sort of tiny-fingered midget designed it. A note: I have not fired a single shot out of the APX Centurion, but I’ll be rectifying that shortly with accuracy testing. This weekend however I’m shooting the full size APX RDO, which is the red-dot equipped model, at Scott Jedlinski’s Red Dot class. Should be pretty rad. I think your best bet for getting a decent concealment holster would be JM custom kydex. I don’t know if they specifically have the centurion, but I know for a fact they have the full sized, and you would think they would be cross compatible. Since you have all 3 sizes, I have a question for you. Will the Centurion slide and barrel fit onto the full size frame? This could be a Glock 19X contender.